Pitch Perfect brings together leading publishers and editors to give you a unique behind-the-scenes perspective of publishing – how they best like to be approached by writers, how they discover new writers and your best pathways to publication. What’s the difference between pitching a magazine and building up to a book-length work? Is digital changing the way we submit? Are there better publication success rates for genre or literary, fiction or nonfiction? With Cate Blake (Penguin), Jo Walker (Frankie), Cassidy Knowlton (Crikey). Chaired by Overland editor Jacinda Woodhead. Tickets: $17 full; $15 conc/unwaged. To book. Hosted by poet Toby Fitch, this workshop will open your eyes to the potential of the poem on the page. By tracing historical examples of visual and concrete poetry — from ancient Greek to early modernist to recent local works — and then by assembling a visual poem of your own, you will learn to explode your poetry across the page, and not just from top to bottom or left to right — in any direction. Bring text (your own poem, another’s, or whatever you like) to reshape during the workshop. 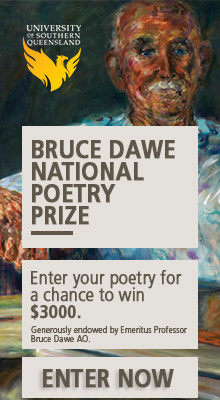 Presented in partnership with Australian Poets Festival and Cordite Poetry Review. With Overland poetry editor Toby Fitch. Tickets: $35 full; $30 conc/unwaged. To book. Breaking the mould can be a messy process – but what can be gained from breaking the rules of writing that we’re often taught? From electronic poetry to performance making, we’ve gathered five artists who push the boundaries of their chosen literary fields and forms to generate new perspectives and narratives for our time. With Didem Caia, Rania Ahmed, andalltheglassjars (Mikaila Hanman Siegersma & Chi Tran). Chaired by Overland’s website producer Benjamin Laird. This is a free event. To book. ‘Being a writer means that you spend 5% of your time writing, and the rest of your time being consumed by jealousy.’ – Khalid Warsame, Twitter, 08/10/15. Eight writers engage in an honest discussion about the times that they have jealously regarded their peers, how to manage this jealousy, and whether it can be healthy. With Overland deputy editor Stephanie Convery, Khalid Warsame, Madeleine Dore, Tim McGuire, Michelle Law, Nakkiah Lui, Lorelei Vashti, Jane Harper.